If you’ve ever been frustrated at trying to get your round soap out of a PVC pipe, you might want to check this out. The idea has been floating around the soap blogs and forums for awhile now. Of course I heard about it right after I had just invested about $50 in a custom sized 2.5″ PVC pipe (the plumbing store would only sell me a full-sized stick), so I wasn’t overly anxious to go out and purchase more supplies. Ok, so I got a little bit frustrated with the pipe. Even freezing the soap in the pipe, then pulling it out and letting it sweat wasn’t working every time. So two months ago I invested another $32.61 in some 2.5″ poly tubing. Hello. A 2.5″ flat tube is totally different from a 2.5″ round tube. Unable to send it back without incurring shipping fees plus a 25% re-stocking fee, I still have it. I let it sit there staring at me for about a month before I decided to go ahead and order the correct size – which was 4″ tubing. 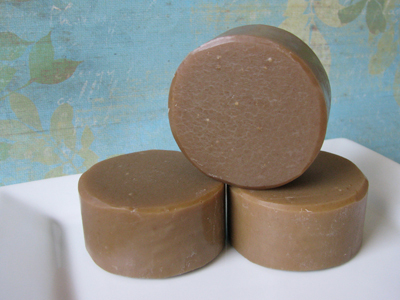 (Yes, 4″ flat tubing will give you about 2.5″ diameter soap.) And then life got busy. Yesterday, I finally got around to making my Beer & Seaweed Shampoo Bars in the poly tubing. Hubby helped me with the set-up. I needed a way to prop the bag up and open while I poured the soap in. The board goes all the way to the back of my supply rack, with a box half full of business cards sitting on top. I had to stand on a chair to get to the top of the tube and pour the soap in! Also folded over a bath towel and placed it on the floor under the tube to catch any drips. I left the soap hanging there overnight. It was actually ready to cut about 18 hours after I poured. The tubing slid right off – success!! 1. They definitely did NOT gel. 2. They have more air bubbles from pouring such a long way down. 3. They are exactly 2.5″ in diameter which is slightly larger than the ones I made in the pipe – pre-cure weight is at least half an ounce more. 4. I’m also short a full bar – partly due to the knot at the bottom of the tube, and partly due to the slightly larger diameter, but I can deal with that! 5. This was SO much easier! I have a batch of the Lemongrass Herbal Mint already poured this morning. This is definitely going to be the way to go for these soaps! 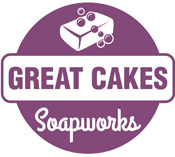 Soapmakers!! Check out the updated tutorial for using poly tubing HERE. Very cool Amy your set up is industrial! LOL! I shared this idea and plastic tubing bags with Emily ways back. I used an orange juice can with bottom and top cut out oh and hubbies hands! Em used a vase! You might use the 2 1/2 ” plastic for embeds?? Can’t wait to hear! This fragrance sounds yumma! Nice set up! I use bags but inside a cardboard shipping tube. Not very long. Your system is much more efficient. Bubbles are an issue I have with my other vertical mold, too. Maybe try to pour along the inside of the bag? And have you considered making guest size soaps with the 2.5″ diameter bags? Ruth´s last blog post ..Sirona Springs is now trademarked! I’ve considered embeds for the smaller bags…just haven’t done it yet. I pulled it out for the landscape challenge, thinking I would make the sun out of it, but it’s too large for that. Love the soap just posted today by A Life Deliberate. So pretty!! Just found your blog and very new to soap making. I mostly want it for our household. I plan to use some frozen juice cans for my next batch. Have you tried those yet? @Julie – I have not. You will either need to use the plastic kind, or remove the aluminum bottom before adding soap. Lye and aluminum don’t mix! Interesting. Are the soaps pretty uniform in shape? I am definitely annoyed with the tubes and need a new option. @Erica – Besides the knot in the bottom, and the one at the top that isn’t quite as round, they seem to be pretty uniform. I would go for it if I were you!! Overall I have to say that I didn’t like how they came out. To me, they looked not fancy enough. If I had a soap stamp, then I would’ve liked them much better….Also, they were a touch messier to cut. I like the plastic tubing idea! You didn’t have to insulate the bag at all? Lindsey @ Bear Soap´s last blog post ..To Market, To Market! Cool and groovy Miss Amy! As always you are a wealth of info and I so appreciate the time it takes to take photos and post about what you are learning. Bags are now on MY shopping list. That looks great! I was going to order the 2.5″ PVC, but have not done it yet…I have found the easiest way to get the soap out of the PVC tubes is to heat it up in a pre-heated, 170 deg. oven (mold & all), turn off the gas, leave on the light, for about 20 minutes. 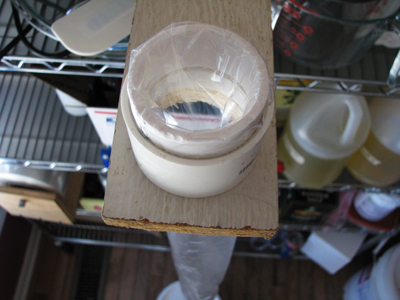 Now mind you this is for the 2″ diameter PVC, but it should work fine if you have a good push rod to push the soap out in the larger size tubes. Works perfect every time for us! That is such a nice set-up! The bars are so nice and round too. Awesome! That looks like a very exciting project! My husband and I love your Beer & Seaweed Shampoo Bars! I have got to try and make shampoo bar now. I’ll definately be buying more of yours tho! I can see lots of sausages of soap all hanging in the future. 🙂 Very neat and so easy and no mold washing. Wow Amy, that is a fantastic idea. 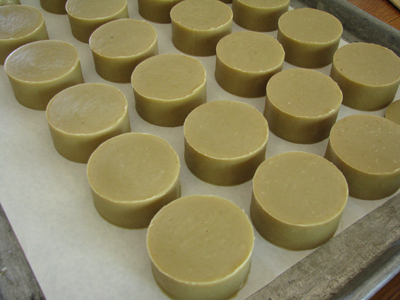 I avoid making round soaps, because I hate trying to get them out of the tubes. OMG – you are super brave. to use such a long bag. I do not have confidence in the quality of our bags here in SA and I would be so worried it would split. Well done. I’m confused about which tubing to buy. Are you sure this is 4″ diameter tubing? How do we get a 2 1/2″ inch soap from 4″ diameter plastic tubing? Did you mean 4′ circumference? Help, please? Wow! Very impressed. By the way, where did u buy the vinyl tube bag? I’m looking to do something similar to what you did, and the link you provided looks like they only sell 2mil thick bags. The place I’d get them from sells 2, 4 and 6mil thickness polyethylene tubing (I’m in Canada). Do you find the 2 mil strong enough? Or would you try a heavier thickness given the chance? @Dagny – I’ve only had one mishap with this polytubing, and I believe it was a manufacturing error where the seam was weak. It started bulging at the bottom and I nearly had a disaster! The thickness of the tubing itself doesn’t seem to be an issue though. Thanks, Amy! A weak seam will cause havoc regardless of the thickness of the plastic, so I might as well save money and get the 2 mil! I’ve already pointed a friend at your site asking if he can help me make this (I should NOT be allowed near any power tools or mechanical construction…I cause more harm than good), and he’s already suggested what are ‘improvements’ in his mind, anyway. I’ll send you picture if you want, once it’s up and running. @Dagny – I would LOVE that! I had a question for you… at the temperature that soap heats up to in the gel phase does the plastic tubing shrink or get damaged? what is the guage of that plastic tubing you are using? @janaki – I haven’t had the tubing shrink or get damaged from gel phase. In fact, unless it’s a recipe that heats or the weather is quite warm, the soap may not gel at all. The tubing is just 2ml thick. I wanted to update you on my soap making setup. In the end, my friend realized that the holder contraption (the pipe and connecter used as a ‘funnel’) really was the best solution. But, he suggested mounting shelving rails to the wall so I could have adjustable heights. And, since the spacing was 18 inches apart (or so), He was able to drill 3 holes in the board, and they fit perfectly between the two shelving brackets holding it all up. What I like about this set up is that I can pour while standing on the floor if I want and have multiple soaps on the go. 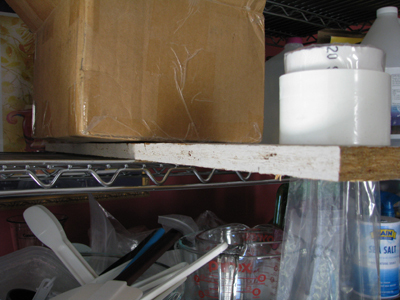 When I’m done pouring, I take them downstairs to a cat-free area where I have bakers racks for curing all the soap. One rack is dedicated (so far) to hanging the long tubes for those first 24 hours until they can get cut. Once cut, they go into the wire baskets on the other baker’s rack for their multi-week curing journey. @Dagny – I love your set-up!!! Thank you so much for sharing it with me! It looks very sturdy and easy to use! Hi, great idea, where do you buy the plastic bags like that in the shape of a tube? I live in Canada. Thanks for posting !! Can you tell me how you avoid air bubbles? I am loving using the polytubing but finding it very hard not to get air bubbles. @Nicola – I use the funnel, and pour very carefully down the side of the funnel and into the polytubing. Your soap batter needs to be pretty thin. Sometimes I tap the side of the tubing after the soap is poured to help it settle. Thanks for the tip. It is definitely better if the soap batter is thinner. Much appreciated! Wow! This is a great idea. I also make soaps and I have the same problem. Thank you for sharing this amazing tip! I use this method from about 2-3 years,it’s very confortable.I am glad that ather soapmaker find this a good method.